Iceland is a land dominated by ice, volcanoes and hot geysers so it may come as a surprise that a band coming from that country use the word "desert" in their name but I am reliably informed that Iceland does indeed have vast areas of wilderness that could be described as desert(ed) and that parts of the coastline are covered in black sand so I suppose that explains that! Black Desert Sun come from Reykjavík, Iceland and started their musical journey, as so many bands do, by practicing in a garage, covering tunes by their heroes Kyuss, Sabbath as well as fellow Icelanders Brain Police but it was when jamming their own riffs that , as they say, "MAGIC started to happen" a MAGIC that can now be heard on the bands recently self titled debut. "Echobrain" opens the album with fuzz drenched aplomb, the band jamming on a doomy Colour Haze meets Sabbath instrumental groove replete with swirling effects and spoken soundbytes. Guitarist Víðir injects into these grooves touches of psychedelic flavouring and colour as well as laying down some tasteful lead work while beneath him the rhythm section of Gestur (bass) and Brynjar (drums) keep the pulses tight and economic. 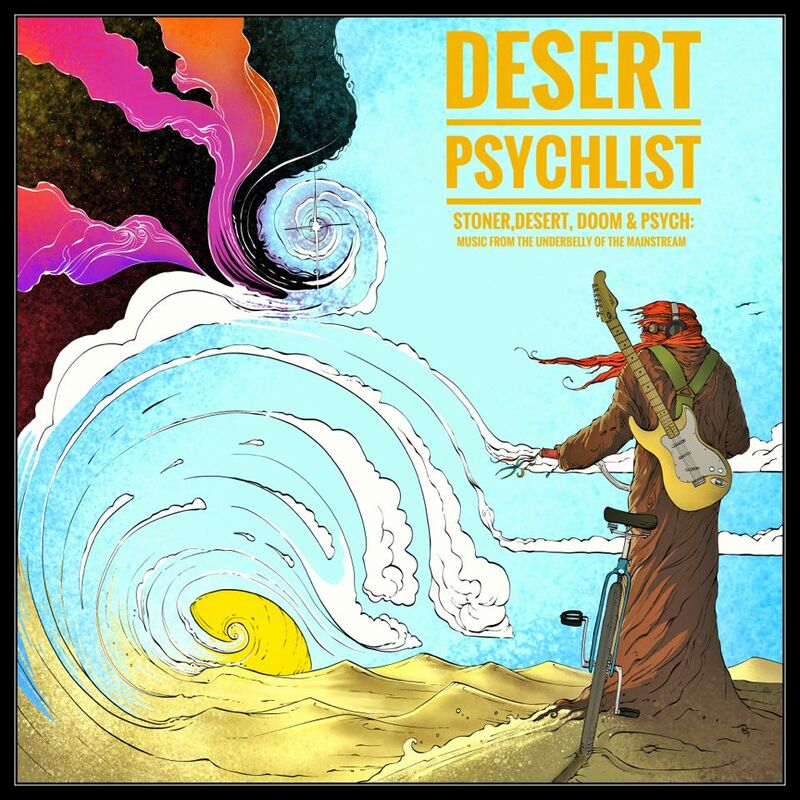 "Spliff Sucker" enters next and the listener is immediately reminded of Palm Springs desert sons Kyuss, the up-tempo, sand blasted grooves recalling a time when Homme and his cohorts looked like being the saviours of underground rock music. One could even be fooled at times into thinking that the great John Garcia is at the microphone if it was not for the fact that this "John " is actually a "Jane" who goes by the name of Björg Amalía! "Pharoas Serpents" continues in the same vein as the previous track but adds a touch of doomy darkness into the groove. 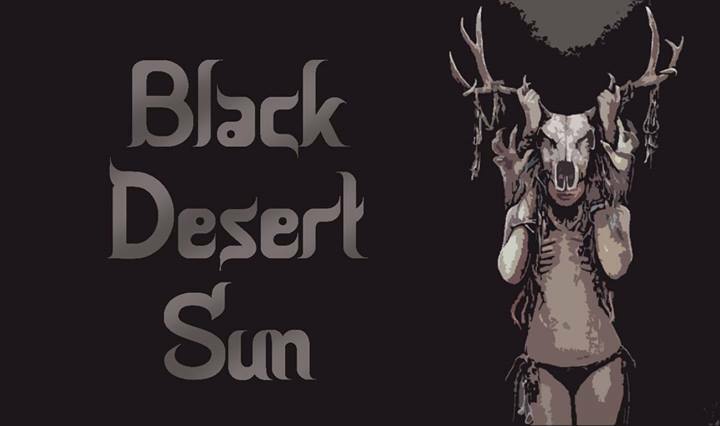 Björg Amalía's gritty vocals sit comfortably within the sandy rhythms surrounding them, her voice possessing a rawness that fits the music perfectly adding an element of desert authenticity to the bands obvious Kyuss worship. Three quarters into the song the tempo picks up a pace and Víðir unleashes a superb guitar solo that swirls and swoops above the rhythmic barrage provided by Gestur and Brynjar, then drops back into the main riff finishing on a sustained chord that takes things to a close. "Psycho Wizard" ramps up the doom hinted at in the previous track and sees the band slide ever so gently into Sabbath country. Björg Amalía's doubletracked vocal veers away from the Garcia like tones employed elsewhere and instead utilises a more melodic and slightly cleaner approach that compliments the songs darker vibe perfectly and gives the vocal a feel not unlike that of North California's psychonauts Sleepy Sun. Brynjar drives the song from his drumstool with an exemplary display of percussive dexterity, channeling the spirit of Sabbath's Bill Ward with his use of cymbals and skins while Gestur holds the bottom end down, his bass rumbling like thunder from the mountains. Víðir when not laying down the songs thick layer of distorted riffage injects perfectly executed and note perfect solo's into this mix that are a joy to behold. "Monster In Haze" sees Björg Amalía joined on vocals by Brain Police's Jens Olafsson over a slightly more straight ahead stoner/hard rock groove. Olafsson's powerful hard rock wail blending perfectly with the Black Desert Sun vocalist's grittier desert tones adding a whole new dynamic to the songs, and the bands, overall groove. "Sparkle Juice" jams a slight "Children Of The Grave" groove beneath a vocal that tells of 24 hour party people and staying up all night. Short. direct and infectious it boasts a chorus that hooks you in and spins you around not letting you go until the final note fades. "Pshychedelic Soundscape III" closes proceedings with a spacey instrumental psych romp featuring band friend and luthier Gunnar Örn Sigurðsson on lead guitar. At 3:35 it's a tad to short to really grab you by the throat but there is enough here of interest to wonder where they could of gone had they expanded this into something a little longer. 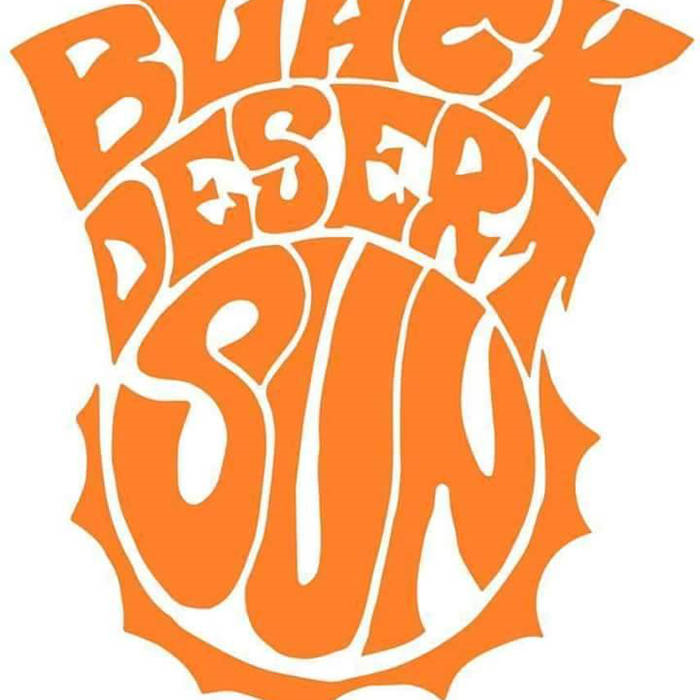 Black Desert Sun have made a highly entertaining album that is full of promise for the future, if it has a failing it is that it wants to be too many things all at once and thereby sounds a little schizophrenic in places. This an album from a band who are still finding their way in the world but this is still a good album nonetheless and when these guys find their own identity instead of cherrypicking from their heroes then you better watch out! Seems that lately, where the underground/alternative rock scene is concerned, that all roads lead to South America, and Brazil in particular! 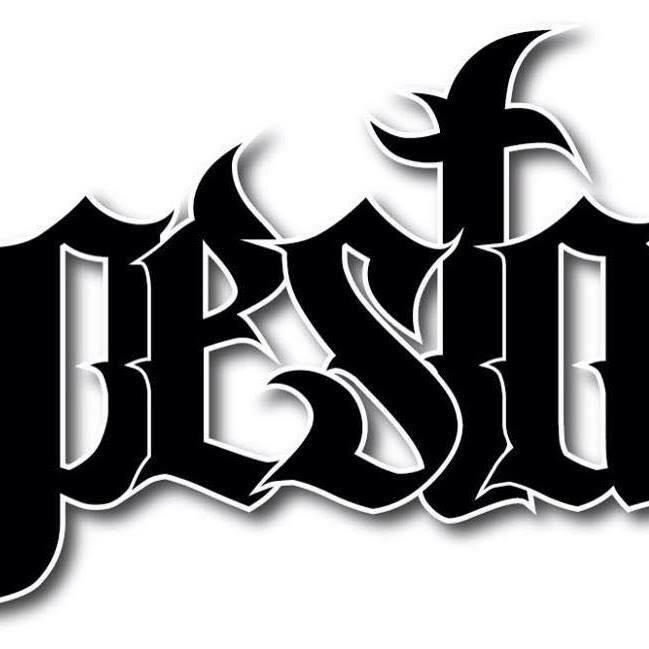 Pesta are from Belo Horizonte, Brazil, a city surrounded by mountains, so I suppose its no surprise that the sound they make is in turn quite mountainous. 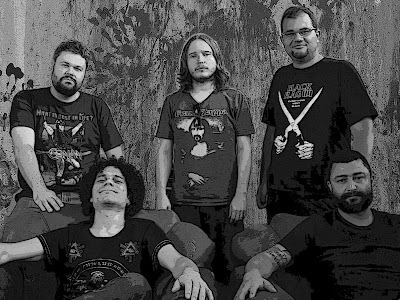 The band consist of Anderson Vaca (bass), Thiago Cruz (Vocal), Daniel Rocha (guitar), Marcos Resende (guitar) and Flávio Freitas (drums) and were formed in 2014 with the intention of making music that paid tribute to their doom heroes, Pentagram and Black Sabbath but also had a flavour of the desert/stoner vibes of Kyuss and Sleep. "Black Death" opens the album and presses all the correct buttons with a slow downtuned funereal riff accompanied by thick sludgey bass lines and pounding drums that then morphs into an uptempo and slightly Iron Maiden-ish galloping groove over which Cruz then adds vocals. Given the songs dark metallic doom vibe the listener could be fooled into expecting black /death metal type demonic growling or at the least a stoner rasp brought on by necking copious amounts of Jack Daniels and smoking too many exotic cigarettes, this is not the case. What you get instead is a surprisingly clean, straight tone that although lacking the pyrotechnics of a Dio or a Dickinson has a latent power that is quite refreshing and totally effective. "Words Of A Madman" is up next and slams straight into gear with the band jamming on a dark Sabbath-esque doom groove. Rocha, Vaca and Feitas lock in tight creating a wall of riff'n'roll complete with subtle shifts of time and dynamics into which Resende then inserts Iommi-like solos and licks as well as chordal accompaniment. Cruz lays a perfect vocal over the top, soaring in the verses then dropping low for the chorus where he is joined by Vaca on backing vocals in a wonderful display of dark harmony. "March of Death". Here we get a glimpse of those desert grooves hinted at in my opening piece, although a far cry from the sandy grooves of Kyuss the song does lean towards a more stoner/desert rock vibe than the doomier Sabbath/Pentagram dynamics of the previous tracks. Cruz shifts his vocals into a slightly higher register over a repeating and catchy riff that that hooks you at the start and will not let go until the final note. "The End Is Near" takes the desert vibe a little further with a delightful little bass dominant groove that at 00:54 seconds is just a tease of what this band may be capable of expanding on in the future. "The Fourth Horseman" grooves around a gloriously infectious circular riff over which the vocals take on a slightly epic doom meter and are punctuated by occasional spoken dialogue. As the riff builds Cruz briefly lifts his vocal into falsetto and, for the first time on the album, he struggles, managing to pull off the vocal operatic but only just. "Possession" closes the album with a slice of classic, atmospheric doom that mixes spoken passages with deep dark ambience and thick sludgey riffage. Slow, pondering with elements of space and psych at its core it builds layer by sinister layer evoking a feel of creeping evil with its lyrics such as "Invisible claws, Marks the body, Bathed in blood, Deep wounds, That shred to the soul" further ehancing that point. 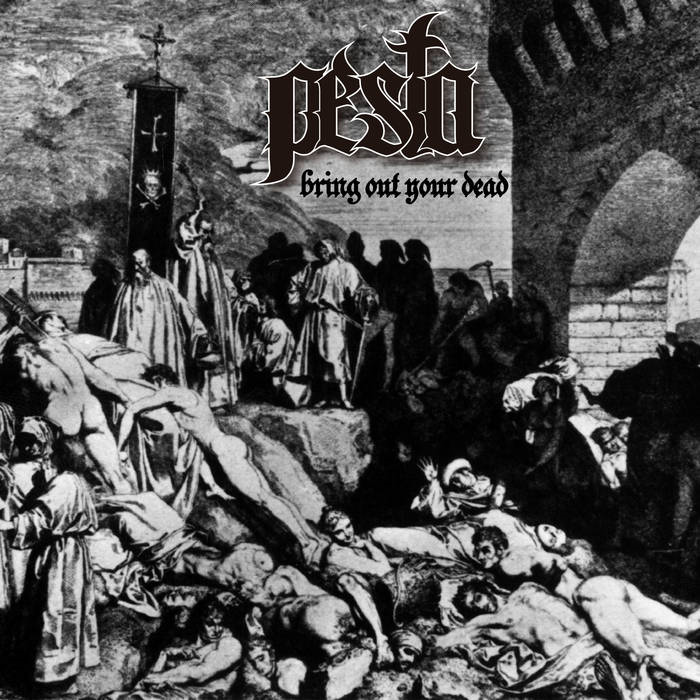 "Bring Out Your Dead" is a GOOD solid album and shows that Pesta are a band to keep our eyes and ears on, a band who are full of promise and who are unafraid to step outside the box now and then. It is not a GREAT album but then very few debut's are but if Pesta continue to make music in this vein, that is this good and has the same sense of adventure shown on these eight tracks then that GREAT album is just around the corner! 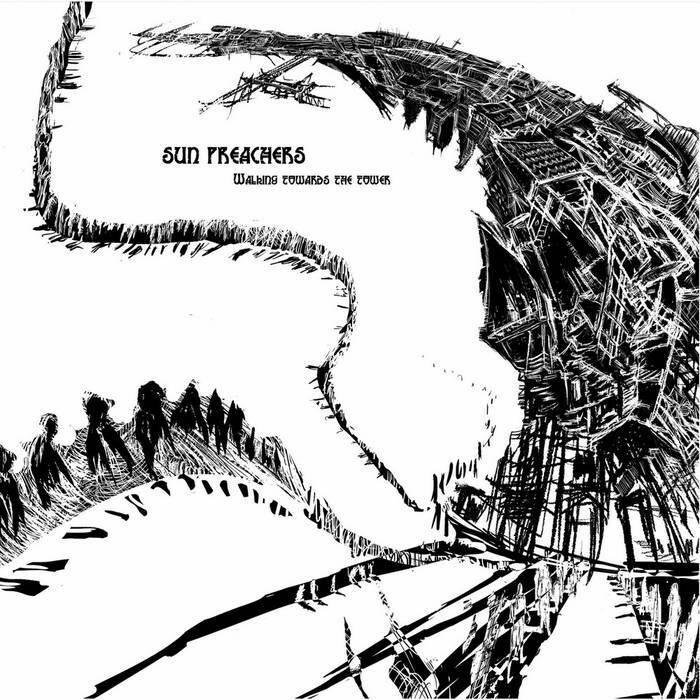 Some bands like to shroud themselves in a cloak of mystery, a little snippet of information here a little there but nothing concrete that us bloggers and journalists can hang our hats on, Sun Preachers are one such band, a band who let their music do the talking for them. And what a glorious music it is....! Sun Preachers are from Bordeaux, France and have been plying their trade around Europe for a while now releasing on their way a couple of EP's Beauty Of Perversion (2009) and 2012's Faces of Ashes (both of which are available as free downloads on their Bandcamp page) These two releases showed Sun Preachers as a band not just content to stay confined within the four to the floor restraints of the stoner/hard rock scene, they showed a band who wanted/needed to stretch out, progress, flex their musical wings and fly. In December last year (2015) the band released "Walking Towards The Tower", six tracks of incendiary hard rock saturated with psychedelic colouring and progressive complexity. "Walking Towards The Tower" takes the classic/hard rock of the 70's mixes it with a little late eighties/early 90's desert/stoner and sprinkles over them elements of both prog,psych and even a little jazz. "This is not something new" I hear you say, "there are hundreds of bands who do the same" This is true but it's the way these elements are fused around each other that make the Sun Preachers sound so uniquely their own. The dynamics of light and shade are used to great effect throughout the albums six songs, heavy rock riffs sit side by side with moments of ambient beauty carrying the listener on a roller coaster ride of emotions and moods. Guitars howl and scream in frenzied anguish one minute then drop down to gentle whispers the next while keyboards fill the spaces in between with swathes of deep atmospheric colour. The rhythm section of bass and drums shift between these dynamics with seamless intricacy sometimes following, sometimes leading from the front, solid and tight when needed. flexible and fluid when the song calls for it. Over this are laid the vocals, strong and powerful in the albums rockier moments yet tender and world weary in its gentler more tranquil sections, conveying a warmth and tone that is a rare thing to hear in these days of growlers and shouters. None of this would be of any use though if the song writing was not of a good quality and that is the strength of this album, the arrangements, pacing, lyricism and structure are all of the highest order and this combined with the high levels of musicianship and the sterling production make this an album any rock fan would be proud to own! Blues revivals have come and gone over the years, a while ago it was the two man crews of The White Stripes and Black Flag carrying the flag at their masts then , like in days of yore, the Vikings invaded with bands like Sweden's Graveyard and Kamchatka as well as Norway's Lonely Kamel cutting a swathe through the dross on their journey to Robert Johnson's legendary crossroads adding a little stoner/hard rock edgeiness to the devil's favourite music . These days though it seems that it is the shield maidens of both Europe and the USA who are holding the rudder when it comes to steering the good ship blues. Holy Grove, The Blues Pills and Ruby The Hatchet have all, to certain degrees, taken the blueprint written by the delta masters and twisted, turned and moulded those minor pentatonic grooves into something quite familiar but excitingly new, adding elements of stoner, psych, occult and even doom and delivering them via strong female vocals. 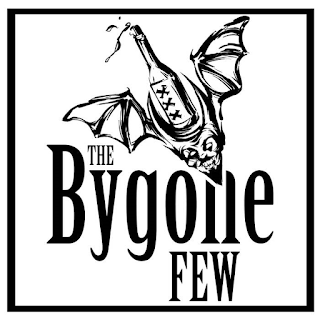 To this growing list of blues influenced bands fronted by female voices I would now like to add the name The Bygone Few! "Beg" kicks off the album with Zeppelin-esque majesty, the band jamming on a "When The Levee Breaks" type riff beneath which M. Bellanca pounds the skins like he has been possessed by the ghost of one John Bonham. The song builds layer by layer ramping up the atmosphere with the guitars of R. Hurley and Goeltz slipping and sliding against each other while A. Bellanca keeps the bottom end low and nasty his bass locking in tight with M, Bellanca's insistent rhythmic pulses. Alone this would put a big cheesy smile on the face of any fan of good bluesy stoner rock but the icing on this cake has yet to arrive. Alicia Hurley's voice explodes out of the speakers soaked in echo and with the sort of feral power that sends shivers up the spines of grown men. Her voice, an instrument in its own right, is a little less Joplin-esque than Holy Grove's Andrea Vidal possessing a deeper, bassier tone more akin to Beth Hart, it's a voice she uses like a weapon stabbing out the lyrics with emotive strength and raw energy taking no prisoners on her way. The song ends with everyone going hell for leather, a maelstrom of voice and noise and when the final note fades into silence the listener is left feeling drained but totally elated. "DuTchess" begins with stroll down the path of country blues, two acoustic guitars playing off one another, one laying down the groove while the other slides and slurs over the top then BANG! the powers been turned on and we are electric again. The band hit into a groove that Jimmy Page would be proud of, a rolling blues riff enhanced with smokin' guitar solos, solid rhythm work and of course those wonderful vocals. "Face To Face" throws the listener a curveball, instead of the blues of the previous two tracks what we get instead is an up-tempo punk/pop workout that owes more to the dirt strewn floors of CBGB's than the plush carpets of the Royal Albert Hall. A. Hurley channels her inner Debbie Harry in a track that sees the bands strip their sound down to achieve a 70's New York vibe that is more Ramones than it is Robert Cray. It's my least favourite track of the album but does show that this band have more than one string to their bow. 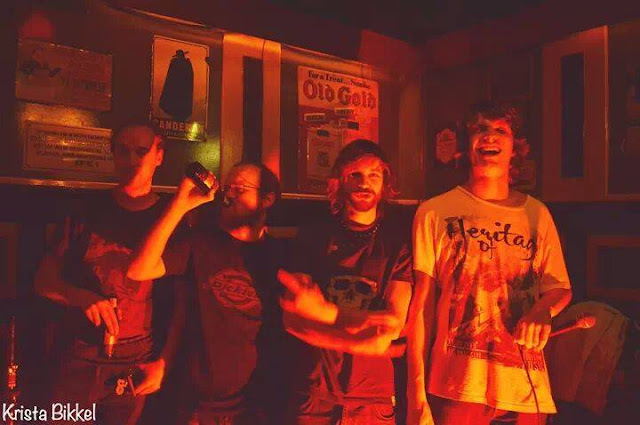 "Alcohol and Mistakes" is back in blues territory albeit with slightly more stoner edge. A lone guitar rocks out a fuzz drenched circular motif before the rest of the band join in creating an infectious and totally addictive groove. A. Hurley keeps her vocal low and smokey evoking a feeling of moody malevolence and regret,... that is until the 2:53 mark when the song segues into more of an up-tempo stoner blues shuffle that takes the song to its conclusion. 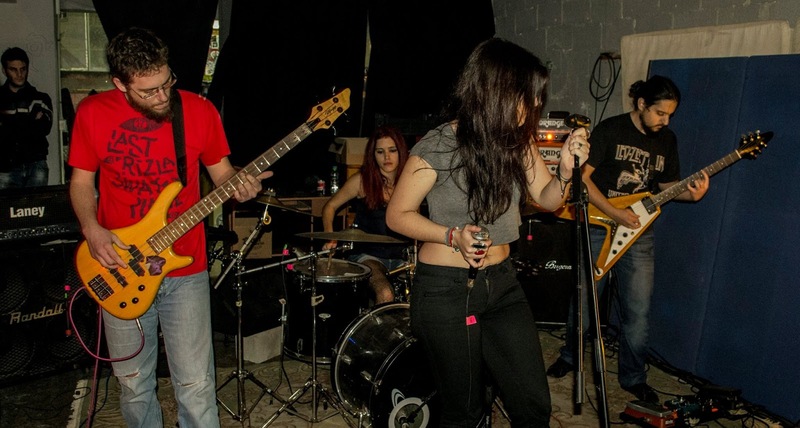 "Kill You Slow" finds the band leaning more towards the hard rock side of their sound. The band groove around the main riff with R, Hurley And Goeltz trading riffs, licks and solo's over, in and around the huge rhythmic pulses being created by the two Bellanca's beneath them, A Hurley again keeps it low and smouldering only raising the temperature when her husband joins her on the catchy chorus yet even on the lower key verses you can sense this woman has another gear she can find if she so chooses. "Undertow" stays in the hard rock arena but those blues are never far away and when the song goes into its mid section they re appear in the form of smouldering guitar solo's and powerhouse vocal displays underpinned with some intense drumming and rumbling liquid bass. "Arrogant" is for this listener the best track on what is an album full of good tracks. It's stuttering riff rolls along nicely with the band all hitting into a cool mid -paced groove until when, just over the half way mark, the dynamic drops down. A, Hurley repeats the refrain "I keep my arrogance" over and over, at first low and smokey and then, as the music around her builds, she slowly ramps it up until she truly let's rip in a stunning display of power and control that is matched by the rest of the guys around her. Guitars swoop and swirl, drums and bass crash and thunder taking the tune to a thunderous and thoroughly enjoyable crescendo. "Sin" closes the album with a mix of stoner grittiness married to the NY punk influence hinted at on "Face To Face" yet still manages to shoehorn in those blues vibes that are such an integral part of the bands sound. The singer roars "You fucked up my heart so I broke your face" with conviction and passionate anger while the rest of the band back up this aggression and angst with a wall of fuzz drenched noise peppered with smouldering guitar solos, riffs and driven by infectious head nodding rhythms. If, like me, you still think the blues has something to say in this day and age but your a little tired of hearing the same old clichés time and time again then check out The Bygone Few you might just find where you left your mojo! 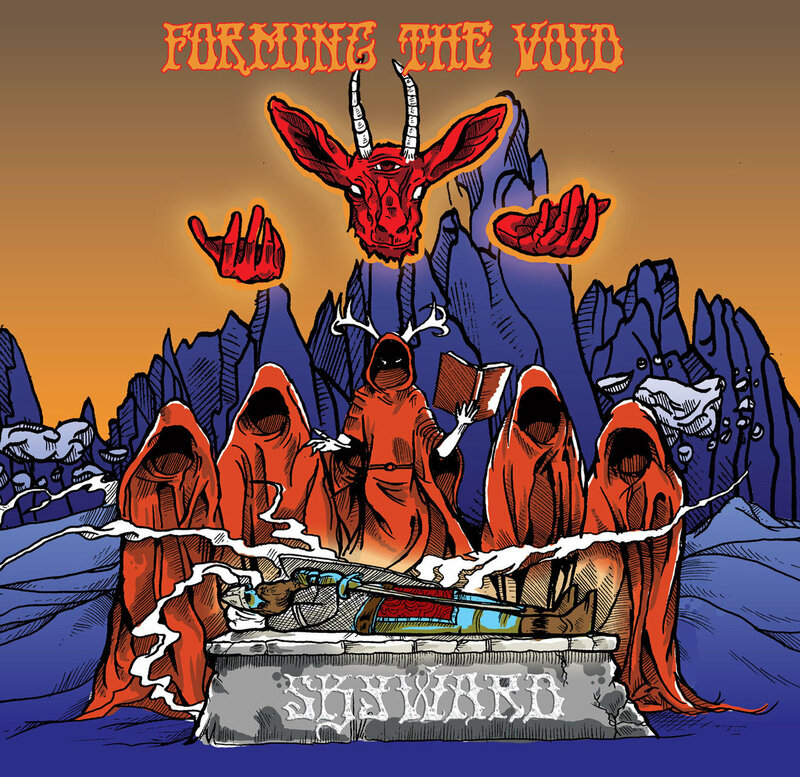 FORMING THE VOID ~ SKYWARD........album review. With so many genres and sub-genres dwelling within this thing we call the "underground rock scene" and combined with our insatiable need to compartmentalise and tag everything we listen to, it can be quite confusing for a new band to find their place in things, Are we a sludge band, are we a stoner band, do we play psych or blues, is it metal and if it is metal are we stoner doom, prog, black or death? It's enough to make you want to split up before you've even bought the instruments! It must be even harder if your in a band called Forming The Void and you incorporate elements of all these things in your music! 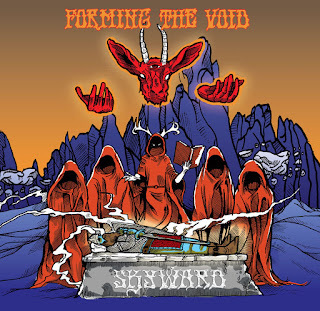 Forming The Void are from Lafayette, Louisiana and are a quartet comprising of James Marshall (guitar/vocals), Shadi Khansa (guitar), Luke Baker (bass) and Jelly Boyd (drums). In 2014 the band released an excellent self-titled three song EP that kind of slipped under the radar of the underground media but undeterred the band have come back stronger and bolder with their new album "Skyward"
"Skyward" opens proceedings with a bang it's eastern themed groove coming across like a "Kashmir" for the 00's, it's gentle slow building raga intro suddenly exploding into a molten dripping volcano of sludge thick riffage and powerful roared vocals. Marshall, his voice strong and powerful and not dissimilar to Spelljammer's Niklas Olsson, roars lyrics full of sci-fi imagery over a backdrop of shifting dynamics as the band effortlessly swing between eastern psych ambience and western stoner/prog metal in a stunning display of skilled musicianship! It is a superb opener and bodes well for what the rest of the collection has to offer. "Three Eye Gazelle" kicks off with fingers sliding up through the notes on the fretboard and then straight into the songs main riff. 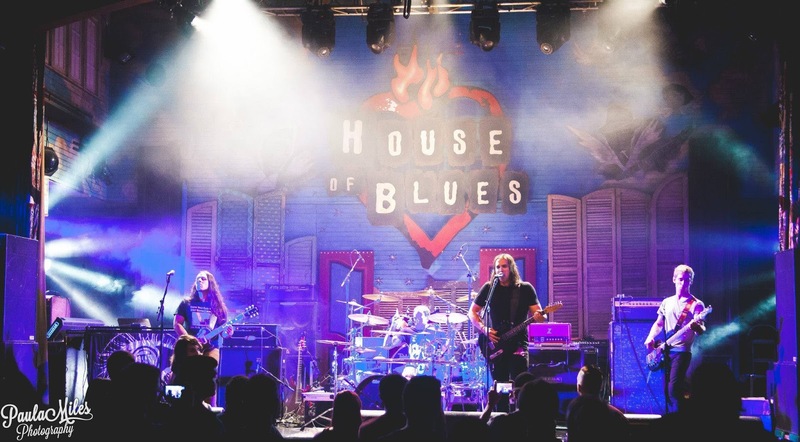 Marshall and Khansa then fall into a loose Alice In Chains type groove, their guitar tones blending together in a deliciously sludgey take on the Jerry Cantrell slur. The songs loose verse/ chorus/verse structure is further enhanced by some incredible bass work from Baker. his deep rumbling bass lines combining with Boyd's mix of intricate and powerful drumming in a wonderful display of rhythmic dexterity.We also get our first glimpse of Marshall's mellower vocal style on this song, when he sings the lines "Eyes fall rejoice the darkest day is done. Arrive the stone we'll sway into the dream as one" he delivers them with a clean grunge -type weariness that has an ever so slight Cobain/Staley vibe and tone to them and works as a nice respite from his full on stoner roar. The song reaches a glorious climax with guitars wailing intto the fade against a wall of dark rhythms. "Saber" sees Marshall expand on the cleaner grunge -like tones of the previous song this time against a backdrop prog-ish metal that again re- kindles the eastern themes of the the title track. Khansa channels his inner John Petrucci by laying down some truly astonishing solo's throughout the songs 6:18, exploring a few exotic scales as well as inventing a few new ones along the way. Marshall holds his end up with thick fuzz drenched distorted riffs, locking in with the rhythm section to create a wall of glorious distorted and beautiful noise. "Return Again", like the last track, travels down the progressive high road but this time adds a little psych atmospherics to the mix, dropping in a few gentle arpeggios inbetween the full on stoner/sludge riffery giving the song an almost Baroness feel on occasions. 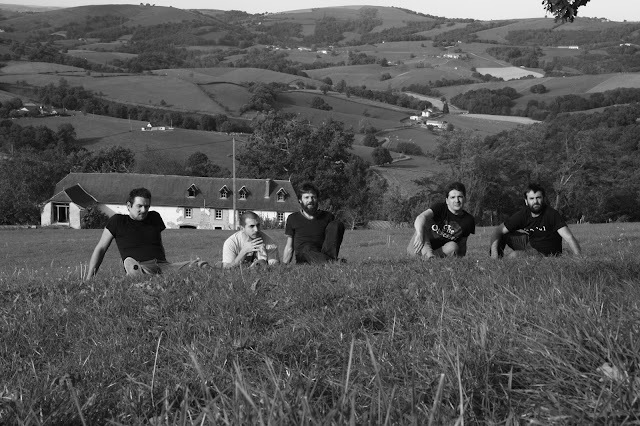 "Sleepwalker" closes the album with a track that totally epitomises what this band are all about, prog, metal, psych, grunge and stoner all pushed into one pot and blended into some kind of alternative musical smoothie. Baker and Boyd shift the rhythms around the guitars of Marshall and Khansa with the former delivering his cleanest vocal of the album and the latter shading the groove with touches of pastel colouring and vivid texturing. A little less intense than the rest of the album it nonetheless merits it's place in this collection if not for its bombast then for its beauty! Do you sometimes yearn for the simpler foot to the floor desert/stoner grooves of Kyuss, Hermano, and their like, when the punk music of the late 70's merged with the hard rock of the earlier end of that era and resulted in a glorious amalgamation of fuzz and fury married to melody and musicianship? Well look no further! Desert Colossus hail from Zaandam, Netherlands and are a four piece made up of Frank Zoomer - Vocals Guitar, Frank Fey - Drums, Tom Collé - Bass and Leon van Wijk - Guitar and deal in a blend of desert rock very much influenced by the Palm Springs desert scene as well as more recent bands such as Red Fang and QOTSA as can be evidenced on their self titled debut album. "Golfshoes" kicks things off with a straight no chaser, fuzzed to the max slab of punked up, adrenaline charged groove with vocals sitting within the clean shouty rap meter that was the trademark of the early skater punk/stoner bands of the late 90's. Frenetically paced and sounding not unlike something from a Fu Manchu/Nebula back catalogue this tune races through 2:35 as if it's life depended on it! This style of 90's stoner groove repeats itself through the next three songs "Whatt! 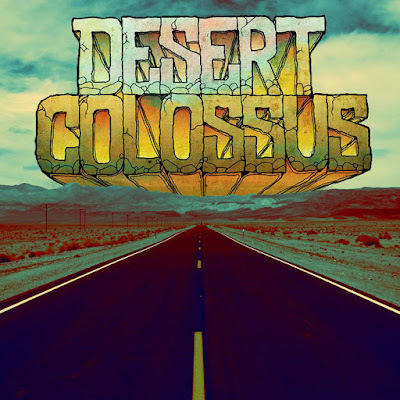 ", "Pariah" and "Fat Chicks", all are good hard rocking numbers and all are stamped with that solid desert sound and punky groove that once echoed out of Palm Springs but it is on the albums fifth track that the band really come to life. edge to it. Lengthier than the previous tracks the band use this bigger canvas to flex their musical muscles and paint pictures that are a little darker and deeper than before. Zoomer's vocal takes on a world weary tone that fits perfectly with dense riffage and slower rhythmic pulses. The song goes into a full blown jam in the last quarter with guitarists van Wijk and Zoomer contributing a myriad of riffs, solo's and licks over a solid wall of rhythm to take the tune to its gloriously noisy conclusion. "Burn Your Friends" takes the 90's groove of the first four tunes but add a little Truckfighters gritty dirt to the mix as well as a little psychedelic colouring and texture. Special mention should go here to the incredible drum and bass duo of Collé and Fey who are unbelievably solid and tight throughout this tune and in fact through the whole album. 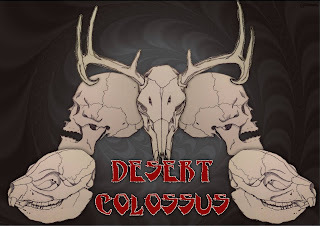 "Desert Colossus" is up next its infectious groove combined with catchy vocal lines and hooks serving as a reminder of when all a band needed for a gig was a few instruments, a generator and a vast sandy wilderness to play in! "The End Is Nigh" closes proceedings with a peach of a track. Big and expansive and boasting a vocal that is more Ozzy than even Ozzy is nowadays, this song would not have sounded out of place on Black Sabbath's last album "13" if it was not for the fact that where Sabbath would of ramped up the atmosphere in the last quarter Desert Colossus go instead for a full on desert/stoner wigout! 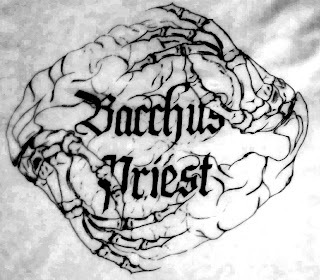 BACCHUS PRIEST ~ Self titled album.... review. Hailing from Athens, Greece Bacchus Priest began their career by honing their skills covering tunes by,among others, stoner/doom icons Pentagram, St. Vitus, Sabbath and Kyuss. The band soon graduated to penning their own songs, taking inspiration from the bands they covered but then adding to the mix elements of hazy psych and gritty blues which they then wrapped in a cloak of doomy occult grooviness. "Red Skies" opens the album with a delicious Colour Haze type circular bass line from Costas that is beautifully backed up by Nefeli on drums, the two locking together in an absolutely splendiferous display of psychedelic groove. Katerina then enters with vocals, her voice a sort of delicious hybrid of UK's Pauline Murray (punk/hard rock pioneers Penetation) and USA's goddess of alt.rock and poetry Patti Smith., her distinctive powerful tones adding a certain alternative doom gravitas to the music and the lyrics. Over this Mike's guitar lays down swathes of swirling psych colouring, hard fuzz riffage and wah drenched soloing, painting sonic portraits with his six -stringed brush. The song although pulling all the bands influences together in one place never allows those those influences to overpower or detract from the bands own unique sound and vision for their music. "Clockwork Thoughts" sees the band hit a more strident groove with Mike's guitar stepping out from the colouring and texturing of the first track and taking a more dominant hard riffing role. Katerina also adds a little grittiness to her vocals, a slight smokey rasp in the lower register and hint of throaty vibrato in the upper. At the 2:00 mark things take a dramatic turn with the band entering into a doomy atmospheric groove before ramping it up into a full blown psych blow out with Mike's guitar leading the way, shredding mind blowing solo's beneath which the bassist and drummer keep it all loose and tight in equal measure. "41° Shot/Out Of The Void" is a song in two parts with the first half being a solo guitar showcase that sees Mike exploring his jazz/classical chops with gently picked arpeggios and jazzy chords being the order of the day The second half is a doom/occult groove monster.that shifts dynamics like a racing driver shifts gears, a stoner riff fest one minute the next all deep bass and echoed vocals only to shift again into slow psych doom/occult territory. 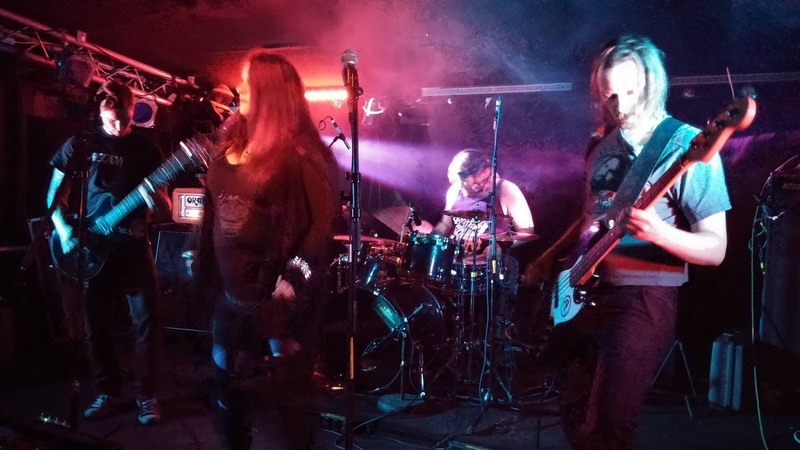 "The Awakening" starts off with a frenzy of feedback, dial twisting effects and white noise before settling into a warm mid tempo stoner groove to which Katelina adds her deliciously distinct vocal tones. Mike enhances the whole thing further by adding a delicious frenetic bluesy guitar solo to the proceedings, a solo that is full of natural feel as well as amazing technical prowess. "Through The Mist" starts off dark and doomy and almost funereal before exploding into a Black Sabbath type groove with Mike employing little Iommi-isms throughout, his vibrato at the end of the riffs, his minor pentatonic solo's all scream the iconic Sabbath guitarists name. Underneath this Nefeli and Costas lay a solid wall of rhythm that Ward and Butler would be proud of. Katelina though is no Ozzy clone and what she brings to the table with her unique tones takes the song out of the realms of mere Sabbath worship and places it into completely different sonic universe. "Sacred Voodoo" closes the album with 10:02 minutes of searing doom laden psych that begins with the band hitting on an up-tempo stoner doom groove with Mike's guitar laying down a swirling drone like guitar motif, punctuated by a catchy lick, that is pushed hard by Costa and Nefeli's insistent rhythm work. Katalina sneers and snarls the songs lyrics with wicked malevolence before the whole mood changes at the 2:50 mark. Here the vibe drops down into a pure traditional/epic doom groove with the vocals following suite. Katalina 's voice drops low, preachy and sinister as if passing judgement on all who stand before her, Mike lays down absolutely stunning dark moody solo's between the verses. his guitar wailing high and free over the solid wall of doom beneath. The song winds down slowly unil it fades away into silence, a silence that allows the listener to catch his/her breath before hitting the repeat button and starting the whole experience again! 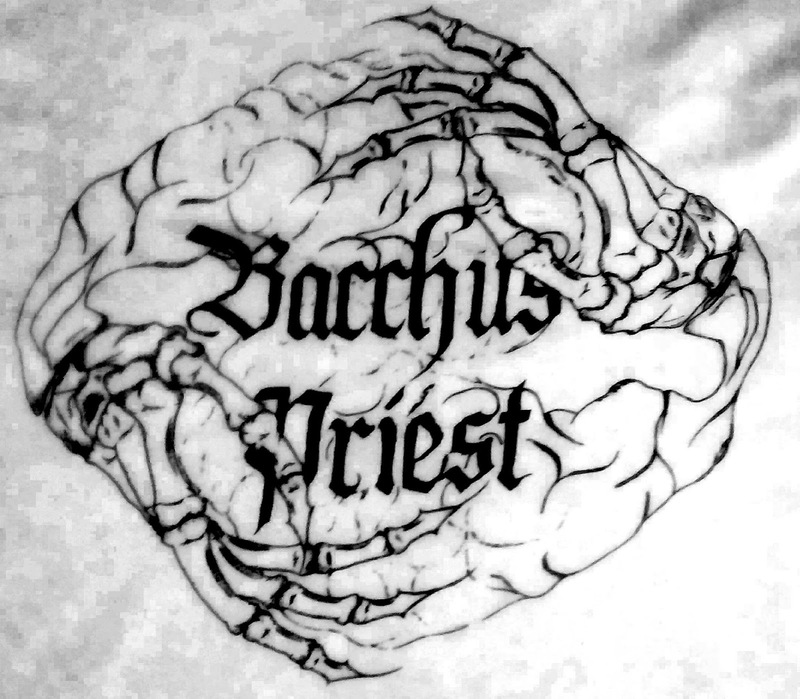 If you like your doom/occult grooves with a deeply dark edge, enhanced with a little psychedelic texture and colouring then check out Bacchus Priest, you'll be glad you did!